At this time of year when so much revolves around children, the season of giving, and with so many presents for Christmas; we at Mini First Aid also wanted to think about those children who are poorly and what we can do to help them. This week we are talking to Karen and Andrew Phillips – Co-Founders of “Give a Duck” and how gifts with a conscience are so important to charities - Chemo Duck is certainly something that is packed with purpose. Can you please tell us more about what "Give A Duck" is? ‘Give A Duck’ is a UK based children’s cancer charity, set up to help ‘Gabe’s Chemo Duck’ (a charity in the USA) spread its wings in to the UK. Chemo Duck is a soft, cuddly companion that provides huggable hope and alleviates fear and anxiety. It was created by a mother for her son, Gabe, when he was diagnosed with cancer at a very young age. The program was developed with the help of child life specialists and medical professionals. Around 1,500 children are diagnosed with cancer in the UK each year and it is our aim to deliver ‘The Chemo Duck Program’ to every child diagnosed with cancer in the UK. How did you get involved with this charity? When our son, Harry, was diagnosed with leukaemia six years ago, he was informed of a new friend (Chemo Duck) he would receive to help him along his new path in life. As parents this was the least of our worries and we soon forgot of this promised introduction, however Harry held on to his hope and dream of getting his new friend but when Chemo Duck didn’t arrive, Harry brought it to our attention. We managed to contact Lu Sipos (founder of Gabe’s Chemo Duck) and soon learned that she was eager to promote the Chemo Duck Program in the UK, as she herself was born and raised in the UK but the problem she faced was the storage and distribution of the ducks across the UK. We both work at Jenkar Shipping and after a chat with our colleagues, we decided that the least we could do was to store and distribute the ducks across the UK. We founded ‘Give A Duck’ in 2014 and it became a registered charity in 2015. How do you think it helps the children and their families? During Harry’s treatment, he never went anywhere without his Chemo Duck, he really was his new special friend. Chemo Duck not only provides this incredible comfort to the child but also acts as a fantastic educational tool used by the medical staff and play leaders, to help introduce the child and their family to their new life and encourages healing through the power of play therapy. 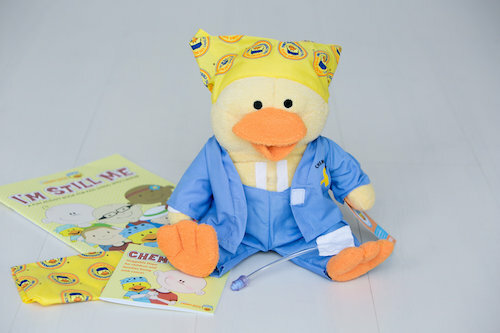 The Chemo Duck program comprises of a soft cuddly yellow duck, with either a port or a hickman line (matched to whichever the child has to administer their medicine), an activity book titled 'I’m still me', ‘Meet Chemo Duck’ information book and a Chemo Duck Bandana. ‘Huggable Hope’ is a special duck designed for and given to siblings. Where is this happening in the UK? We are currently providing The Chemo Duck program to the following principal treatment centres across the UK including; The Leeds General Infirmary, The Royal Manchester Children’s Hospital, Great Ormond Street, The Great North Children’s Hospital, The Bristol Royal Hospital for Children, The University College of London Hospital and The Royal Marsden Hospital. We also work with various cancer centres and their local charities to introduce the scheme and its many benefits. The cost of one Chemo Duck program pack is £25 and Huggable Hope (sibling duck) is £15. However, due to the charitable funds we currently have, we are able to provide the ducks free of charge and with no postage costs –but we will always need these generous donations from the public to keep our charity going and to try and support all of the principal treatment centres across the UK. How can others help with this amazing charity? We are currently planning many exciting things for the charity including an online shop where you can buy ‘Give A Duck’ merchandise including fashion forward t-shirts, a drawstring bag especially handy for carrying Chemo Duck and other merchandise including ‘Give A Duck’ supporter pin badges, pens and more. We are also planning a regular giving quick and easy sign up page and the option to donate to a specific principal treatment centre on the website, so wherever you are in the country, ‘Give A Duck’ is close to you.